I knew this wasn’t going to be an easy time for us. We started off in the round robin playing the San Francisco Bulldogs, who were throwing ex-minor leaguer Andy Torres. Our staff was equally awesome as Sergio Moreno beat the Bulldogs 4-1 to start us off. Mario Chavarin and Bobby Yanez followed with complete games and 7-1 and 15-1 victories. We called on Cisco Vega to lead the way in the championship game against the Woodpeckers. He ended up throwing a six-hitter with six strikeouts. This was a tough victory as Chicago threw ex-big leaguer DJ Carrasco at us. We played at the College of Southern Nevada, who has a built-in radar gun. We faced his fastball that came in between 87 and 91 MPH all day but we hung in there. In the first inning Ruben Hernandez hit a double to left and scored two batters later on a sacrifice fly to start the scoring. In the third Frank Rodriguez singled, Hernandez singled and then Junior Esparza tripled to score both runners. Esparza then scored on a passed ball. The Angels then tacked on runs in the sixth, seventh and eighth to close out the scoring. Ruben Hernandez went three for four and scored three times as the lead-off hitter. Our pitching staff did great by only allowing three runs in the entire tournament. Ruben Hernandez led the team going 10 for 15, two walks and six runs scored. 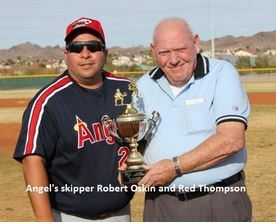 Daniel Arruda, Ralph Fernandez and Eddie Nava also had a big tournament along with Javier Gamboia’s two dingers. This year had a really tough field but wee keep coming back with the same core group of guys and this turned out to be one of the strongest outing we have ever had.